Montauk is located at the far eastern end of Long Island. It is about 125 miles east of New York City. 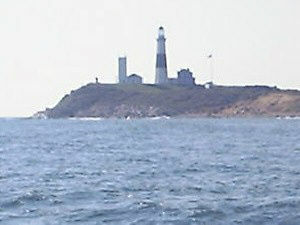 Montauk is New York State’s largest commercial fishing port. This region is known as one of the sport fishing capitals of the world. It is home to over 25 current world records. The waters of Long Island Sound flow into the Atlantic Ocean at Montauk and bring in vast amounts of bait and nutrients. This attracts great schools of Striped Bass, Bluefish and Fluke. Since Montauk is all ready so far out in the ocean it makes it the closest port to the canyons and the gulfstream. This in turn creates a fantastic fishing opportunity for off shore trips for tuna, shark, and marlin. If the water is too rough for off shore fishing the in shore fishing is always great. 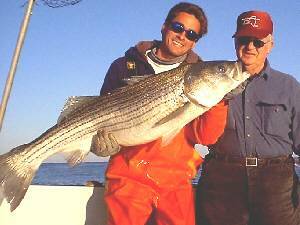 During an in shore fishing trip anglers may encounter the following species Striped Bass, Bluefish, Fluke, Porgies, Sea Bass, and Flounder. 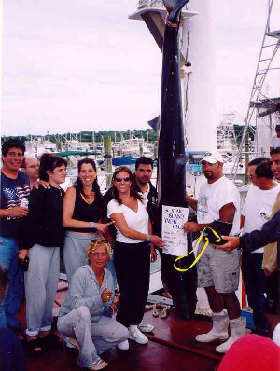 The Montauk Boatman's and Captain's Association Shark Tournament was held over the July 13 and 14, 2002 weekend. The lucky winners were aboard the Montauk Charter Boat King Wayne. First Place in the MBCA’s Shark Tournament went to the King and his crew of 4 Queens and 4 Jacks for pulling in a 330 Pound Blue Shark. 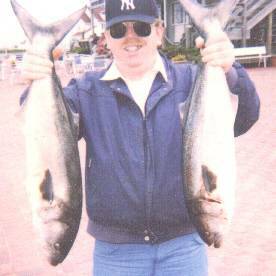 Raymond Martin is pictured here on a June 2000 trip to Montauk to fish for striped bass and blue fish. Striped bass were the target species but nice blue fish like these are welcome any time. A group of six of us go down every year we stay overnight for 2 days and fish 2 half days on a charter boat in the mornings then do some surf fishing at dark it is awesome. The cost of an excursion of this nature was about $350.00 a man this included the motel room, charter boat, food, gas, and car rental not bad for a lifetime full of memories. The date was October 7, 2003. The place was Montauk NY. 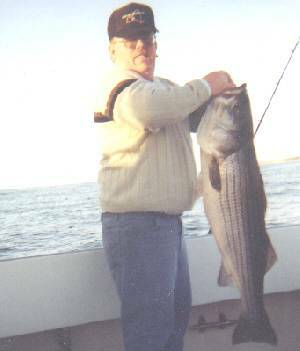 The fisherman was Raymond Martin of Elmira, NY. He is holding a 30 plus pound striped bass that was caught and released to fight another day. Still looking for that 40 pound plus fish and getting closer every year. Maybe next year will be the one. I'm sure Montauk will be the place many fish over 40 pounds are taken here every year. Fish over 50 pounds are becoming more common.